Luckily for you, a collaborative research team led by Florida State University also started analyzing this scenario. By using big data modeling, the group took a careful look at boarding procedures and what might work better to reduce the spread of highly infectious pathogens. In a study published in Physical Review, scientists used multiscale modeling combined with individual and group movement to study transmission of infection in airline settings. Airlines develop boarding processes around their passengers and flight schedules. Those flying business class or on Rewards board first, generally filling the first part of the aircraft — first on, first off. But if there were a dangerous pandemic impacting air travelers, do you want to sit there in first-class while every single passenger breezes by? During an outbreak, maybe last on, first off, is the higher-value deal. Turning boarding processes on their head, these researchers did not suggest ways to board faster, but instead, they found ways airlines could slow down the spread of germs throughout the boarding process. The study authors note that commercial airliners can transmit infectious diseases like influenza, measles, norovirus, and tuberculosis. Objects and air can quickly become overcrowded with microorganisms, some contagious, some not. How Icky Are Airplanes, Anyway? As a major mode of transportation, airplanes and airports host a lot of travelers — and even more germs. The rise in air travel comingles luggage, people, and pathogens from far-flung parts of the globe. Your seat back (upright or not) tray table far and away counts as the germiest spot near your airplane seat. The overhead air vent button is next, followed by the bathroom flush button (makes sense), and then the seatbelt buckle. In the airport, the buttons on the drinking fountain were teeming with microbes, with a distant runner-up being the stall locks in the bathrooms (also makes sense). This kind of study offers some good information — maybe swab down that tray table with hand-sanitizer before you plop down your laptop — but any household, office, or public surface is loaded with microbes. So, while it's nice to know where we find the most germs (very likely your cell phone), it is also a good idea to know how they get passed around in the air. According to this study, and common sense, several criteria that impact the level of contagion you are exposed to as you haul your carry-on into the airplane cabin. While it won't ease your anxiety any, it is important to know germs travel everywhere, and infectious diseases do too. The World Health Organization notes that properly ventilated airline cabins can decrease the transmission of infections. The European Centre for Disease Prevention and Control reports the close quarters of an airplane, plus contaminated surfaces, contribute to the spread of infectious pathogens among people and between geographic areas. During the Ebola outbreak in 2014, passengers and flight schedules were interrupted in an attempt to reduce the international spread of the disease. Cancellation of flights in and out of areas affected by Ebola curtailed delivery of needed supplies. The Ebola crises offered a heads-up in understanding the challenges of dealing with a pandemic in the age of air-travel. Keep in mind the likelihood of any given person contracting an infectious disease also depends on their relative health, age, medical history, and particular vulnerability at that moment to an infectious agent. Three-section boarding strategies have a greater likelihood of spreading infection because they require passengers to wait for longer periods, increase direct contact, and create densely (although temporary) clusters of passengers trying to hoist luggage and settle into seats. Zone boarding that requires blocked aisles exposes everyone in the aircraft, front to back, to infections. The study authors suggest a "two-section" strategy whereby the plane is divided into two sections lengthwise, and the airline boards passengers randomly — which reduces dense clustering and clogged aisles. 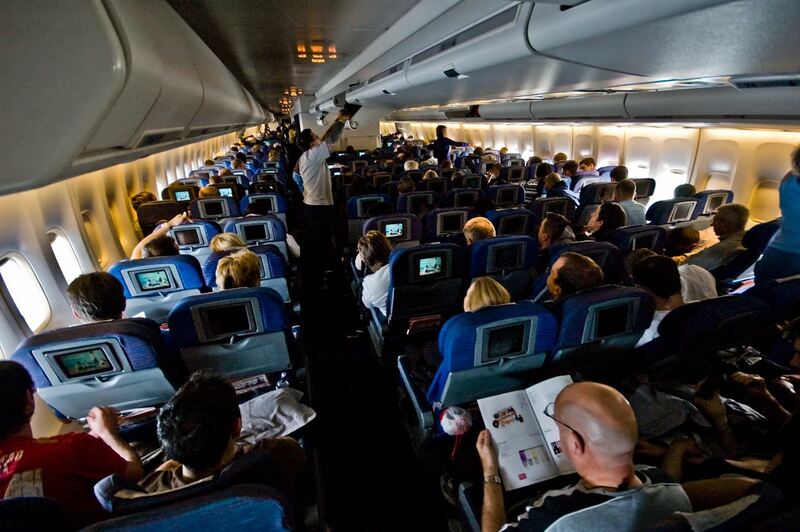 For deplaning, the study authors suggest approximately the same in reverse, or emptying alternating rows, or closest to exit passengers in order. Airline seats are typically 18" wide. The more distance you have from sneezed or spewed droplets, the lower your likelihood of infection. There is not much you can do on a crowded flight with a sick seatmate and no vacant seats. Smaller planes are more effective in reducing contagion due to smaller capacity. The healthy edge disappears when the number of seats (the profit center for airlines) is above 150. Shorter flights means less exposure time. At present, airlines like Southwest Airlines use random boarding processes as passengers pick their seats throughout the plane. This type of boarding seems well suited to avoiding picking up infections, according to this study. When the next pandemic occurs, airlines might also want to think about using smaller capacity airplanes and instituting policies that decrease the direct contact between potentially infectious passengers by changing their boarding routines. In the meantime, the CDC suggests steering clear of passengers that seem ill and treating all bodily fluids (vomit, mucous, blood, and diarrhea) as infectious. While the main CDC suggestion is hand-washing, that can be kind of tough on an airplane, so be sure to carry hand sanitizer with 60% alcohol content. Just like it is important to pay attention to the safety features of your aircraft, do your best to navigate past or around groups as you board your airplane. Better yet, just hold back and wait until the aisle is clear, instead of standing cheek to cheek with a stranger with red eyes and a cough.